I am not a big New Years Eve person. I don’t know why. I like to be sparkly, I like to drink. But I guess I like to do it on my own days and decisions. But I do like to have a silly little at home party on NYE. I will be looking forward tonight to doing some things I find irresistible. Wearing sparkly jewelry while doodling. The only difficult thing that I have to say is that I have to choose between which of two shows to watch “Airwolf” or “Ally McBeal”? Who shall I share the new year with? 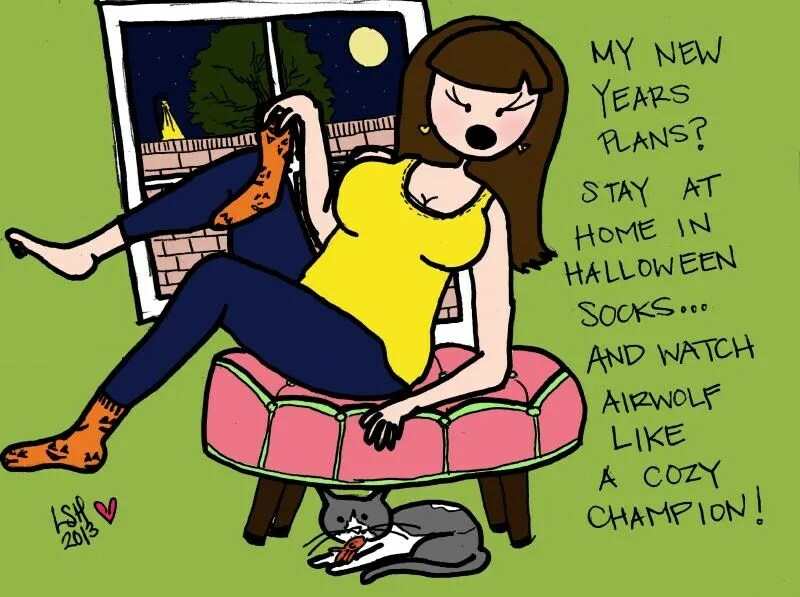 I love a lazy new year! Anyways I think my New Years resolution is to doodle more, and have more fun than ever before! I hope you have a fun night and great next year too! I like the way you think! Are you planning on mastering any specific songs in your car? I am very adept at singing “Stay” from Lisa Loeb while driving. I am about to list that as a skill on my resume! I hope you have a wonderful new year and you can celebrate each and every day all the ways you want!